A lovely sunny day without any rain today, so obviously I made huge amounts of progress and am nearly finished. And if you believed that, I have a bridge to sell you. 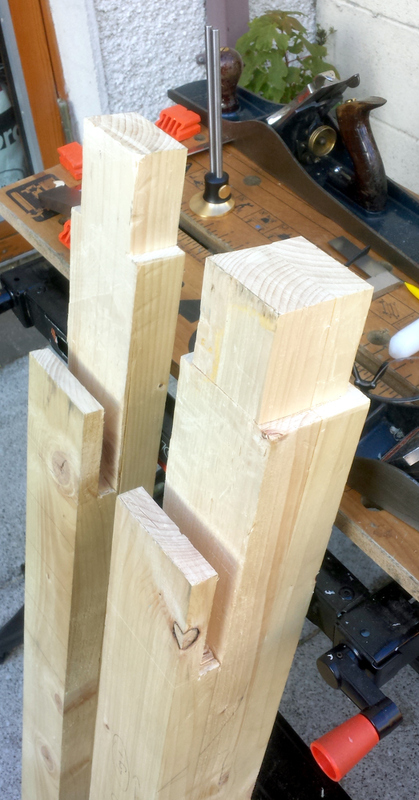 I finished tidying up the end cut on the benchtop and started on the layout of the leg tenons. 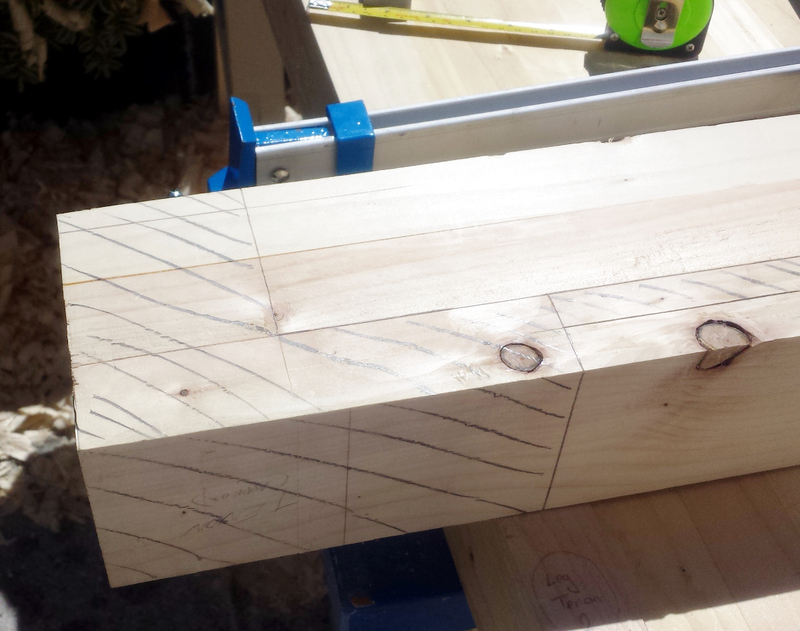 I started that by checking the mating between the leg tenon boards and the benchtop center section. You might remember that I had the great idea of leaving those two edge boards seperate from the center laminated section so as to make cutting the leg mortices easy. The problem was that some eejit left the two edge boards seperate from the center laminated section so that marking out where the mortices would go was nearly impossible. In the end, I gave up on the mortices and decided I’d glue the boards to the center section and do the mortices then; and in the meantime get on with cutting the tenons. The back legs should be a relatively straightforward tenon, about a half-inch shorter than the benchtop is thick (there’ll be a dado on the underneath of the benchtop). But the joint on the front legs is a tad more irritating. 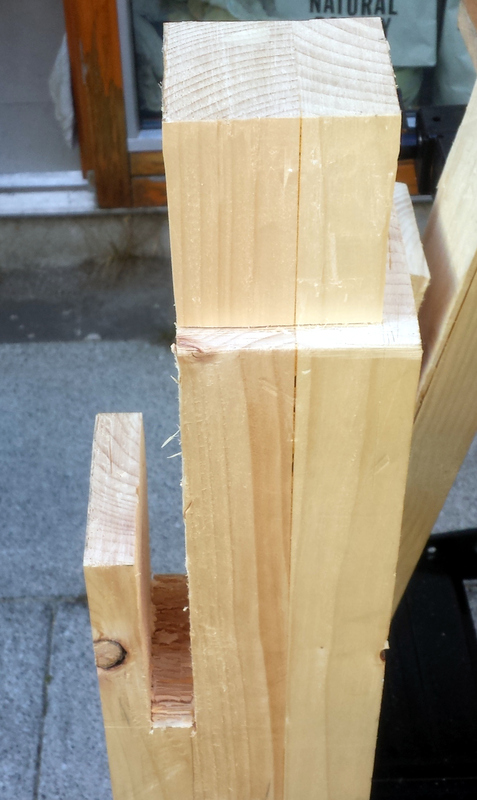 Cutting those joints proved… difficult. I mean, it’d have been easy, if I had a bench, but… well, you see the problem. 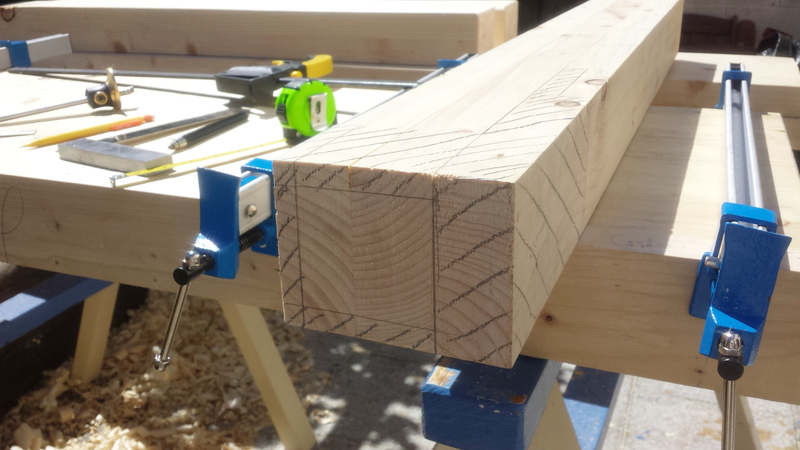 In the end, I resorted to cross-cuts through the waste and splitting the tenons by chisel, then clamping the leg to the edge of the benchtop as it sat on the sawhorses and cutting the notch while kneeling in a bloody awkward position driving splinters into my knees. Yay? I wasn’t happy with that machete-work and there followed a lot of paring and planing to get things more square than circular and a little tidier, but I don’t think Doucette and Wolfe are quaking in their boots. 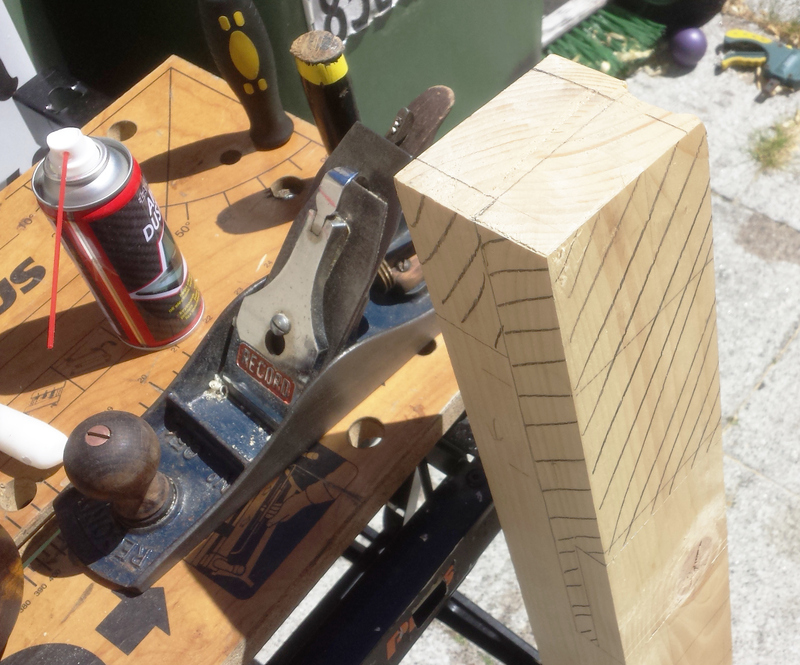 After that, I spent a half-hour working on the mating joint between the center section and the leg tenon boards and tried to get them to mate a bit better, because frankly the mating I initially had there was more reminiscent of a cross between a great dane and a pug. But I was able to get it to a so-so state and glued up – and then spent ten minutes swearing and running about with a mallet beating the extenstial angst out of the edge boards trying to get them to line up with the center section of the benchtop because the clamps kept shoving them out of alignment. Whose stupid idea was it to leave these things out of the benchtop glue-up in the first place? That idiot needs his head examined. In the end, managed to get them kindof aligned (there’s going to be a benchtop flattening in my future anyway I suppose, oh well) and they’re clamped up and under a tarp as we speak. Next week, unfortunately, I’m on-call at work (which isn’t as bad as it would be if I was a doctor or something, but it does pretty much guarantee at least one night spent working on something that breaks as the US guys wake up), but I might get a few hours during the evenings if I’m lucky. First order of business is either to cut the mortices for the stretchers or to cut the mortices and dados for the legs in the benchtop; either way, the idea is to try to get the leg frames made up and ready to plug into the benchtop. Then I can work on cutting the joints in the aprons so that they can get attached to the benchtop – one at a time I think, after today’s fun and games – but before I glue those on, I’ll have to remember to do the mortice for the planing stop and the mounts for the vice.